Brando's new button spy camera is one step closer to international super spy. 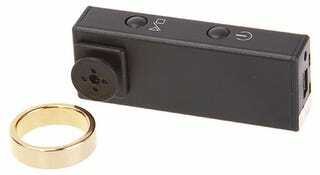 You wave an ordinary looking gold ring near the device to take photos and video. That's right, friends. No more pesky fiddling with your buttons when you've infiltrated deep inside the Russian Parliament.